Tucked away in gorges and ravines, bridges in Greece have achieved over the years the connection of people from various areas. They were built with a yearning for beauty and functionality, blending perfectly with the environment. The huge advancements in technology have made our travels around the globe, easier and more comfortable. Ultra modern aeroplanes, cruise ships, luxury trains and motor vehicles bring the world closer together. We should not though underestimate the impressive ports, airports, motorways and bridges that make our trips so attractive and fun. The bridge that links Rio with Antirio in Greece could well be included in one of the modern technological miracles. A few miles down the road there are other man made creations that deserve our attention and admiration. 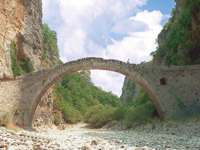 These are the arch stone made bridges, the subject of our topic, which are found in abundance in Greece. Tucked away in gorges and ravines, they have achieved over the years the connection of people from various areas. They were built with a yearning for beauty and functionality, blending perfectly with the environment. The difficulty of their construction and the imposing presence provided the impetus for people to create their own tales and stories about the construction. 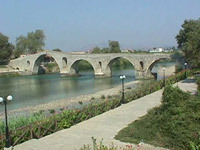 The most famous of all is the legendary bridge of Arta, where, it said that the foreman sacrificed his own wife by burring her in the foundations of the bridge to ensure its construction and stability. It is worth while for any visitor in Greece to search and visit some of these bridges that have become legendary in their own right. 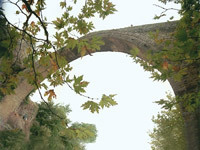 Some of the photos provided depicting these bridges may provide an incentive for a brief visit.